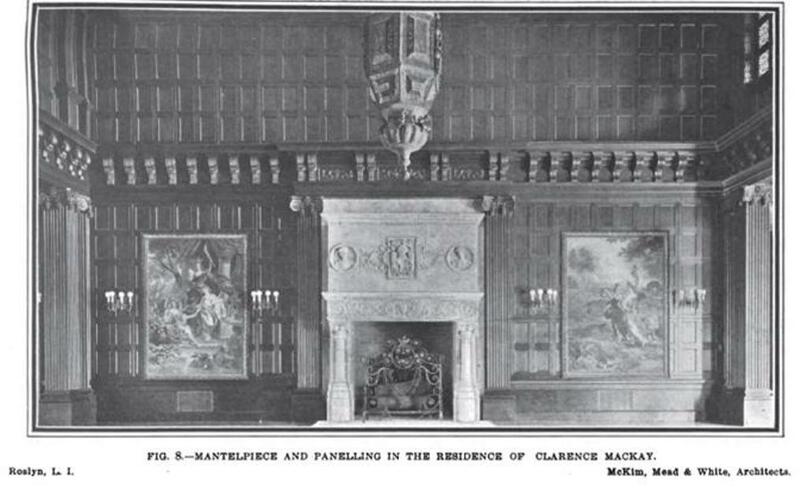 Some additional interiors to 'Harbor Hill', the Clarence Mackay estate designed by McKim, Mead & White c. 1899 in Roslyn. Click HERE for more on 'Harbor Hill'. 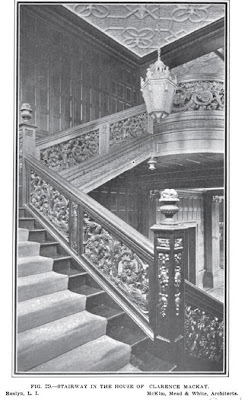 Photos from Architectural Record, 1904. 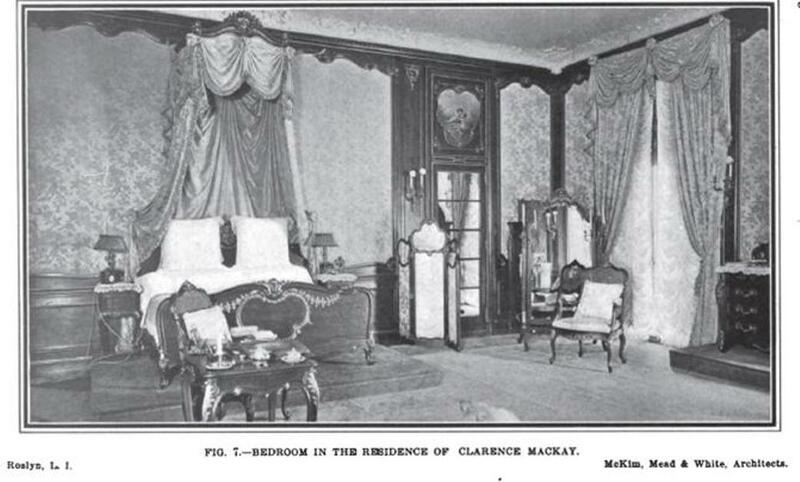 As to the bedroom, it's nice to see that old money Katherine Duer had no trouble adapting to being nouveau riche Mrs. MacKay.. I know I sound like a broken record...but I still can't get over the fact that these homes have been demolished...either by developers or the owners themselves!!! Very different from Europe who seem to have much more respect and a love of preservation. It also strikes me as ironic, since most of the guiled-age rich tried to emulate the European aristocracy especially when it come to their homes...but didn't seem to instill the same sense of a obligation to protect and preserve history and art. I know the personal income tax and the absurd property taxes played a major role, but I'm surprised that not more of the owners, (or in most cases their children), took steps to set up some sort of preservation act to save their family homes like Peggy Phipps or Coe did for their's. I just think it's sad....I have cousins that live in Scotland and England...in old homes with creaky staircases and drafts of cold air sneaking through 200 year old windows...and they revel in it. 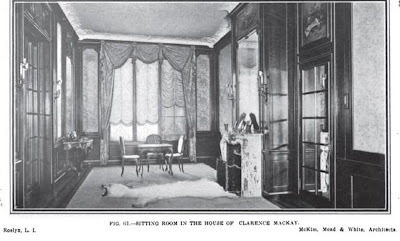 • The ‘Sitting Room’ – has only three chairs in it (you couldn’t even play bridge) … & the second of the two polar bear skin rugs seen in these photos. As I’ve said before I’m not opposed to hunting but this was not hunting. • The ‘Billiard Room’ – I pity the poor maid whose job it was to keep the cobwebs out of all those antlers. 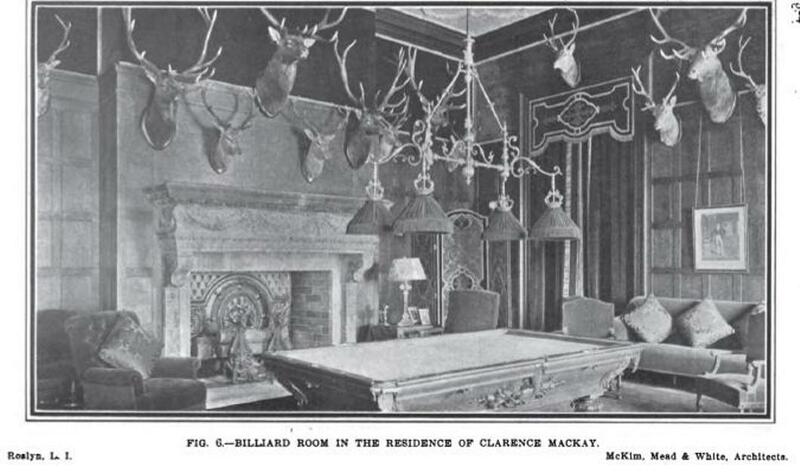 & I agree with DED that the room would have felt manly enough with far fewer stuffed heads with antlers on the wall. • The bedroom – those look like electrical cords all around the nightstand on the left – does anyone have insight to what all that is? It’s a very nice bedroom but I wonder how often someone stubbed their toe on that raised dais (or is that just me)? It’s a shame this house didn’t last & I applaud the State of NY for at least trying out an alternative use for it (I want to remember it a retirement home for state workers for awhile). 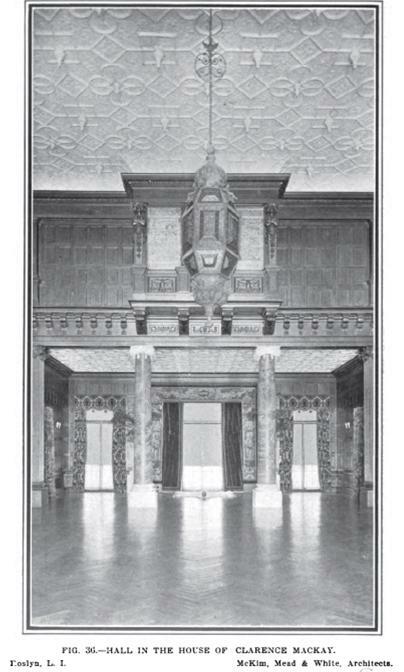 I get a kick out of the "styling" or lack thereof that went into many of these early interior photos. Check out the odd "sitting room" with the Austrian shades (is that what they're called) raised to different heights. And what an odd, narrow room it seems to be. Magnus, re: the narrow ante-room. Have you seen the book about Harbor Hill by Richard Guy Wilson? If not, stop at a bookstore on the way home. You'll love it. Of course, I'd be more surprised if you hadn't than had. 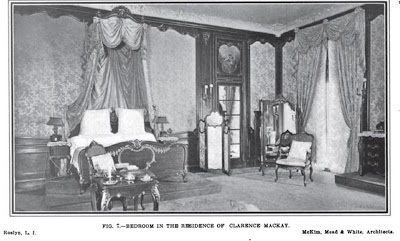 A lot of the oddities are the direct result of Katherine MacKay's very firm ideas about what she wanted---various bits of her correspondence and instructions to the architects over the years are just amazing. Amazing. Barely into her 20's, and that girl knew what she wanted, and she wanted it now. The house she moved to in Tarrytown with her next husband, Dr. Blake, was as far from Harbor Hill as one gets. Just big and ugly. As for the cords, as Magnus points out, styling a room for photographs wasn't yet a profession, so we often get these rooms photographed 'as is'. Ditto the electrical cords. Nowadays they'd be twist-tied, hidden, or air-brushed out of the picture---and also it was the nascent era of electricity----cords were messier. I am right there with you. It blows me away that this home was bulldozed. It's hard for me to beleive that such a thing of architectural detail and beauty was just trashed and could not find an owner or another use somehow. Happened quite often unfortunatly. I studied architecture at NYIT and wished I had the chance to see Harbor Hill. I have driven around the neigbourhood several times trying to envision what it must have been like. I have the book that came out recently which is wonderful, full of great photos, plans and stories. A must read for anyone who loves these homes. DED, I am much obliged for the link to the floor plan – thanks. In the pictures Zach posted yesterday the caption for the ‘Butler’s Den’ said it was the first room in the servants’ wing; I can’t read most of the room names on the floor plan but I think I can identify the butler’s den. 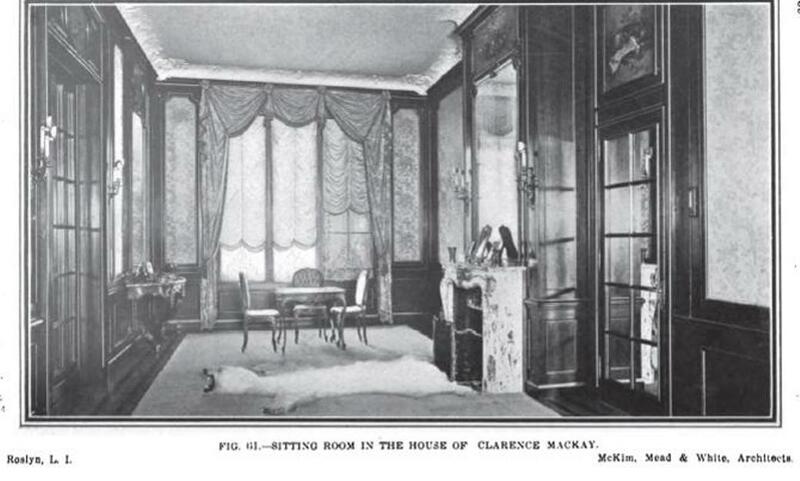 Per the floor plan there is a door to the hall to the right & a door to the butler’s pantry behind the photographer who took the picture, so maybe the room is not quite as claustrophobic as it appears. The floor plan also shows a small window at the end of the room on the left … but I can’t see it in the picture (maybe it was left out as a cost savings measure … joke). By the way … no one yesterday mentioned the silver vault so I’ll comment today – wow! DED, I have something for you: here is a link to Architectural Record Volume 1 (1891 & 1892): http://books.google.com/books?id=4msXAQAAIAAJ&pg=PA133&dq=Architectural+Record+1891&hl=en&ei=-bznTf-eMab20gGpzZWJCw&sa=X&oi=book_result&ct=result&resnum=1&sqi=2&ved=0CDEQ6AEwAA#v=onepage&q=Architectural%20Record%201891&f=false on page 483 is the architect’s (Rowe & Baker) proposed drawing for Kenarden Lodge. The entrance was changed quite a bit from the drawing & I think for the better. I’ve already pulled a pretty decent picture of this & went to your web-site to see if I could send it to you but I didn’t see a place to contact you (which doesn’t mean it isn’t there … I just can’t find it). You may already have this but I didn’t see it on your web-site so I thought I’d offer it up. I was pondering my earlier comment about putting the blame solely on the owners of these homes and developers, and I realized I was somewhat wrong...I think the way our culture views "old things" and the importance it puts on progress was also a major influence in their descions. American's, especialy,the Americans of this century, have become a sort of throw-away culture. I don't think, (and I could very well be wrong), that we had any kind of preservation society until the original Penn Station was torn down in '63.And still, I think, even today, preservationists and people like us on the forum are a minority. The majority of people I know view old homes, big gardens, and antiques as dirty, or too bothersome...as an interference to their easy day-to-day lives of fast cars, entertainment, cell-phones and gadgits that I have no clue as to their purpose. If we as a culture took pride in our artisic achievements of the past, we would have incorporated these estates into newer developments or made use of them as historic public buildings, or in some way saved them for future generations and blended them within the modern landscape. They must have been a happy couple, no twin beds! In Consuelo Vanderbilt's biography "The Glitter and the Gold" she says Katherine Duer always wanted to play "queen" in their childhood games and felt entitled to control everyone of her playmates. DED- you know what a mess those pesky deer leave - not as bad as geese but almost. i think HH is such a great example of a big house done really well. even a dolt could look at these interiors and see the quality of the work here. 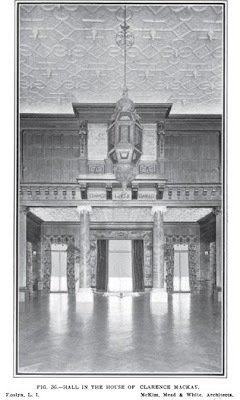 and the scale of the interiors matches the scale of the exterior - not always the case in these big houses. all that incredible woodwork - was it saved - nope - this house was dynamited. they drilled holes about waist height and blew it up. they removed the tapestries and a few chandeliers and the rest - blown to smithereens. in my perfect world, i would hand the younger McKay a lit stick of dynamite with a short fuse and run like hell. this was a crime. i'm to upset to even define the security word.